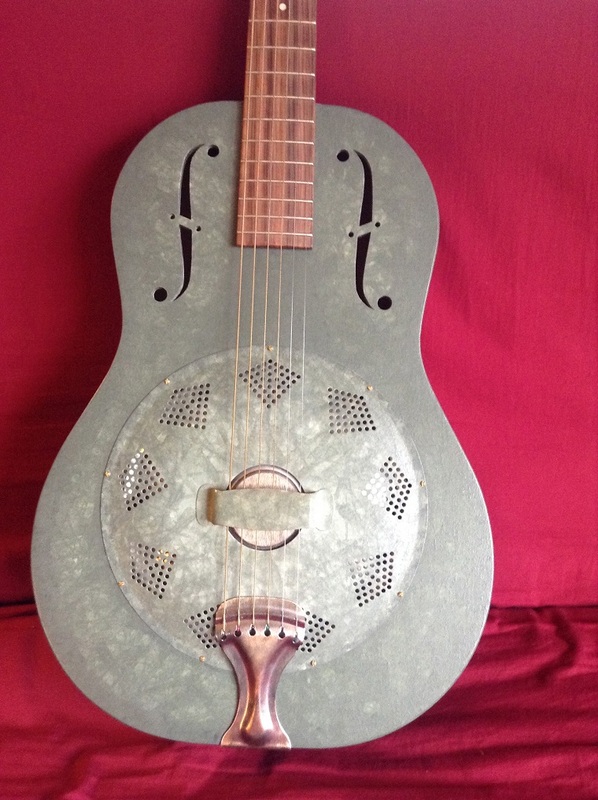 just go on the record and say, “I think resonator guitars are super cool and intriguing instruments”—and they have some very banjo like construction features. Since I started out in lutherie at a guitar building school, this project afforded me the chance to draw in equal measure from both my experience of building bunches of banjos and what I leaned studying guitar construction. 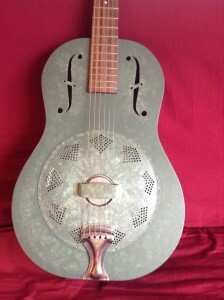 These instruments have an aluminum cone that is the heart of the sound (like a banjo head would be) and the biscuit bridge guitars are built like banjos in that they have a “dowel stick” that runs the length of the body to provide rigidity–remember, you cut a BIG hole in the top for that resonator cone. The cone sits on a ledge in a “soundwell” and I built and turned a block rim soundwell (like a little mini banjo) that makes a solid, stable and great sounding foundation for the resonator cone. Since the sound of these guitars comes mostly from the cone, the guitar bodies can be built to be tougher than your typical flat top guitar; they are made of plywood. They aren’t so sensitive to humidity either. You can leave them out on a stand and spend your time playing music instead of running around the house filling humidifiers and checking your humidistat. I had a lot of fun on this one, trying to get the look and vibe of some of National’s old metal body resonators that were finished with this kind of crystally looking finish (Duco) that looks sort of like galvanized metal. I attacked it in a much more earth friendly, non-toxic way by hand-painting the guitar with milk paint and then a light oil finish over that. I’m not saying you could eat this finish but man, paint made from milk protein and shellac dissolved in Everclear sure feel a lot safer to work with.